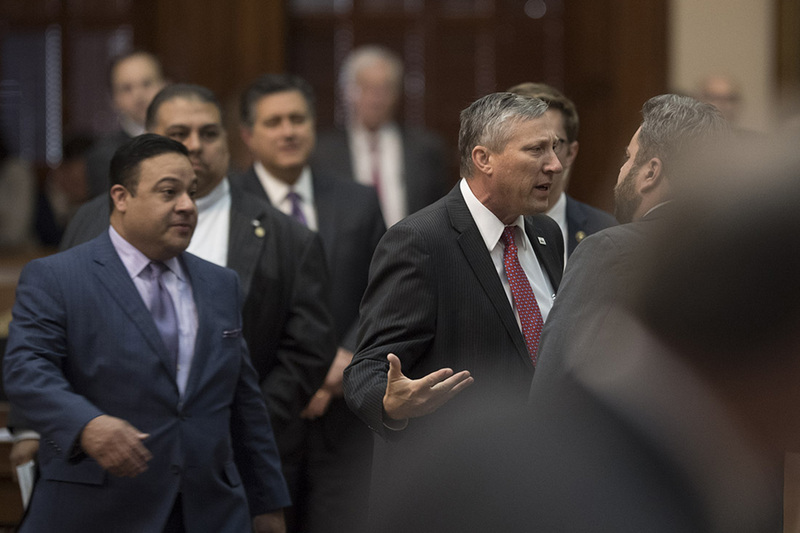 "The House takes up the budget: a day in pictures" was first published by The Texas Tribune, a nonprofit, nonpartisan media organization that informs Texans — and engages with them — about public policy, politics, government and statewide issues. 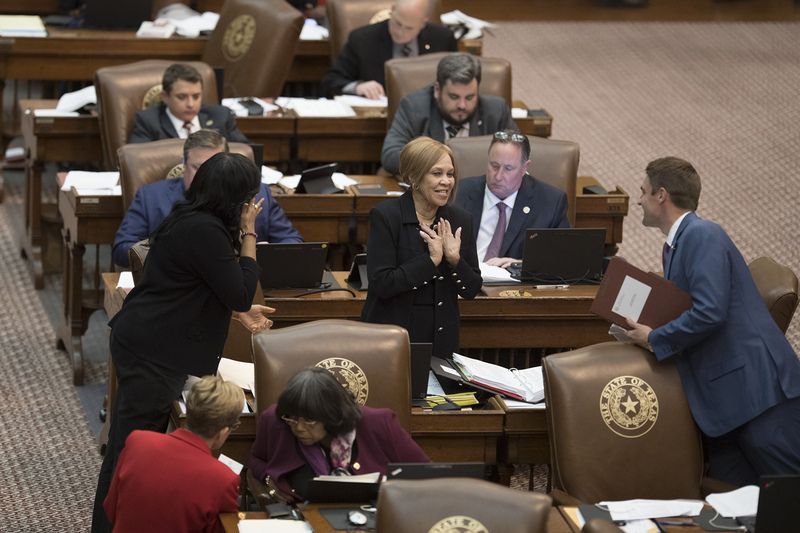 After more than 15 hours of debate, the Texas House passed a budget early Friday morning, 131-16. We were there for every minute. Here's a look at the day's events in pictures from photographers Bob Daemmrich and Laura Skelding. Correction: An earlier version of this story incorrectly referred to state Rep. Charlie Geren as a 20-year veteran of the Texas House. 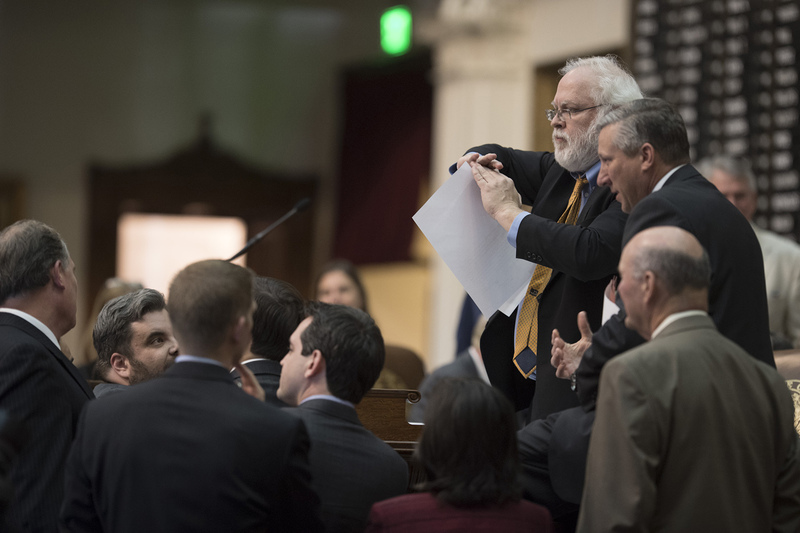 The House takes up the budget: a day in pictures By John Jordan April 8, 2017 *Correction appended After more than 15 hours of debate, the Texas House passed a budget early Friday morning, 131-16. We were there for every minute. Here's a look at the day's events in pictures from photographers Bob Daemmrich and Laura Skelding. 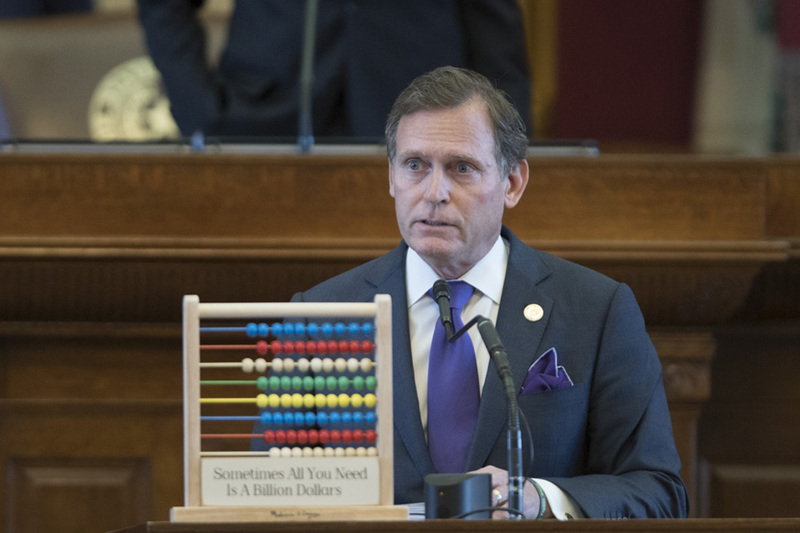 State Rep. John Zerwas, R-Richmond, chairman of the House Appropriations Committee, lays out the budget with an abacus as a prop. The plaque reads, "Sometimes All You Need Is A Billion Dollars." Bob Daemmrich for The Texas Tribune Zerwas works the floor in the early hours of the budget debate. Bob Daemmrich for The Texas Tribune House Speaker Joe Straus visits with Rep. John Frullo, R-Lubbock. 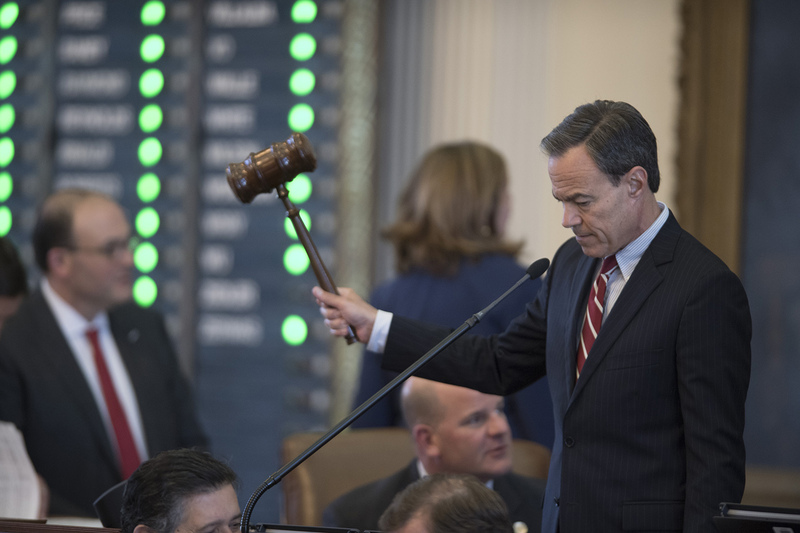 In a statement on the budget, Straus said the House plan "keeps Texas living within its means while making investments that will strengthen our economy and brighten our future." Laura Skelding for The Texas Tribune Lawmakers prepared for the long day in different ways. 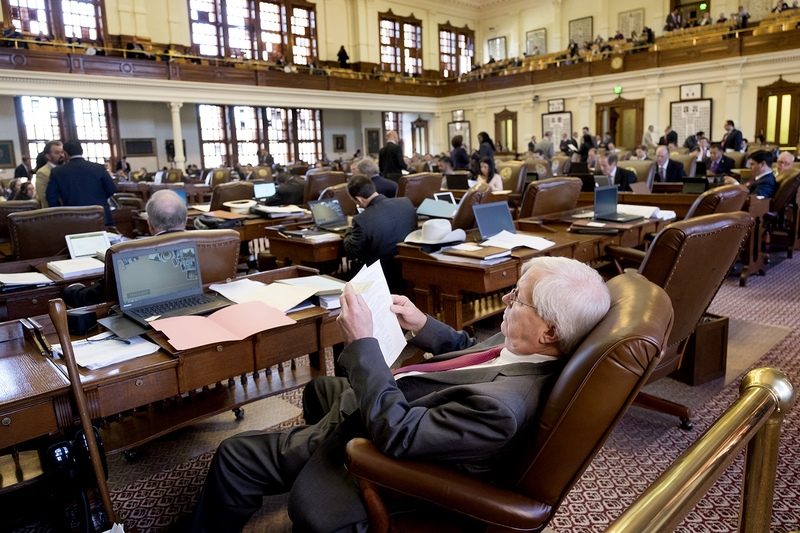 State Rep. Charlie Geren, R-Fort Worth, a House veteran, gets comfortable. 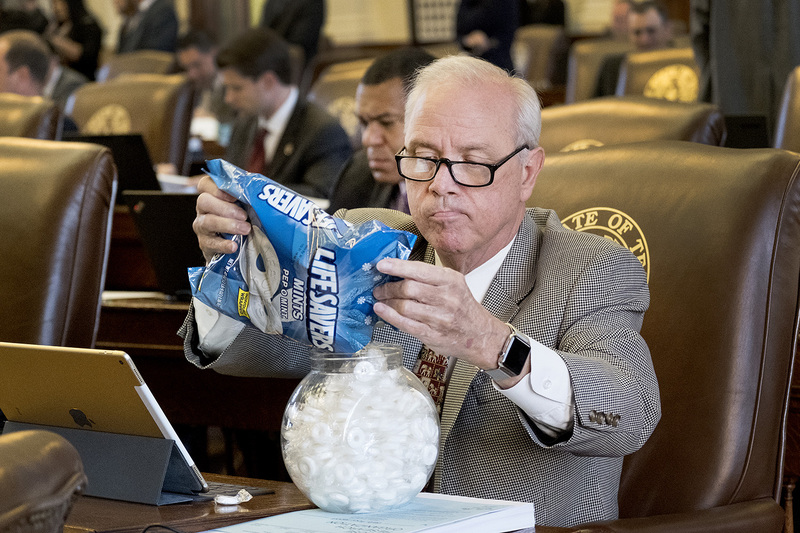 Laura Skelding for The Texas Tribune Rep. Gary Elkins, R-Houston, makes sure his candy bowl is well-stocked for the long day. Laura Skelding for The Texas Tribune An early moment of contention arose after state Rep. Sergio Muñoz, D-Palmview, passed an amendment to strip $43 million from the governor’s Texas Enterprise Fund. Here, Rep. Jonathan Stickland, R-Bedford, delivers a speech denouncing the vote. 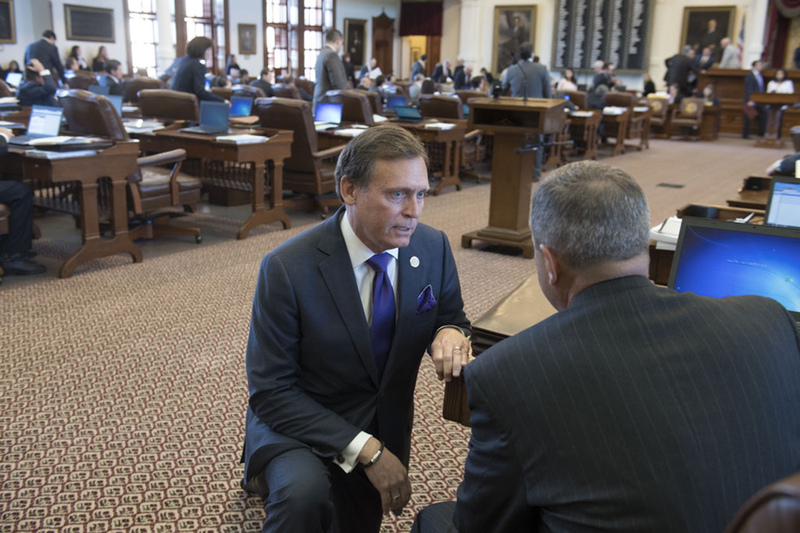 Laura Skelding for The Texas Tribune Frullo and fellow Rep. Richard Raymond, D-Laredo, huddle on the House floor during the debate. 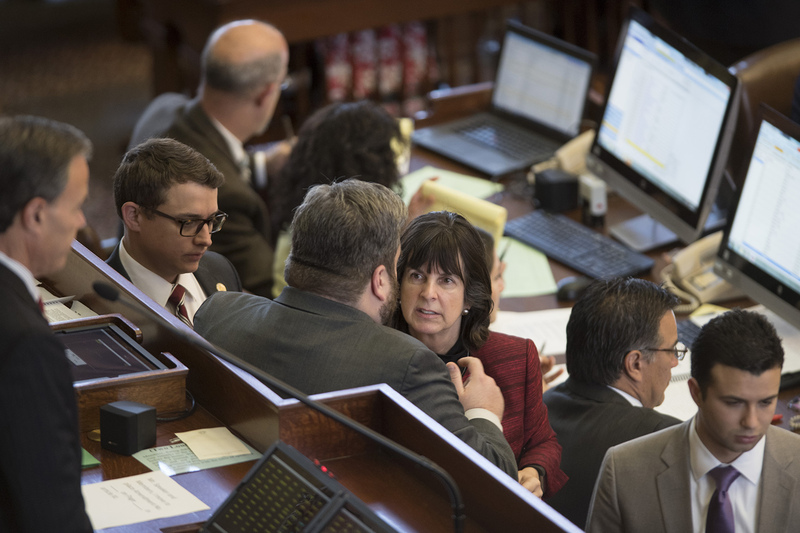 Laura Skelding for The Texas Tribune Rep. Valoree Swanson, R-Spring, shown here speaking to Stickland, offered an amendment mirroring the state Senate's "bathroom bill." It didn't get a vote. 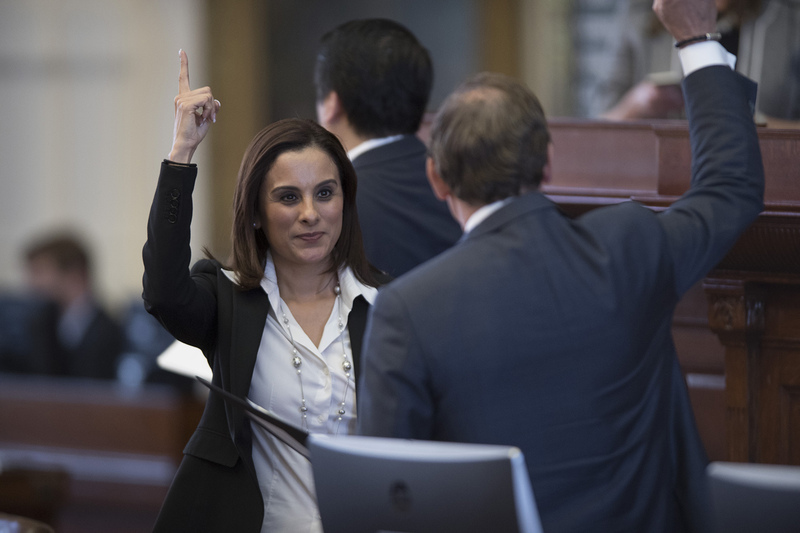 Bob Daemmrich for The Texas Tribune State Rep. Ina Minjarez, D-San Antonio, votes in favor of her amendment to cut some funding to the attorney general's office and use that money to fund programs serving vulnerable children. It passed, 82-61. 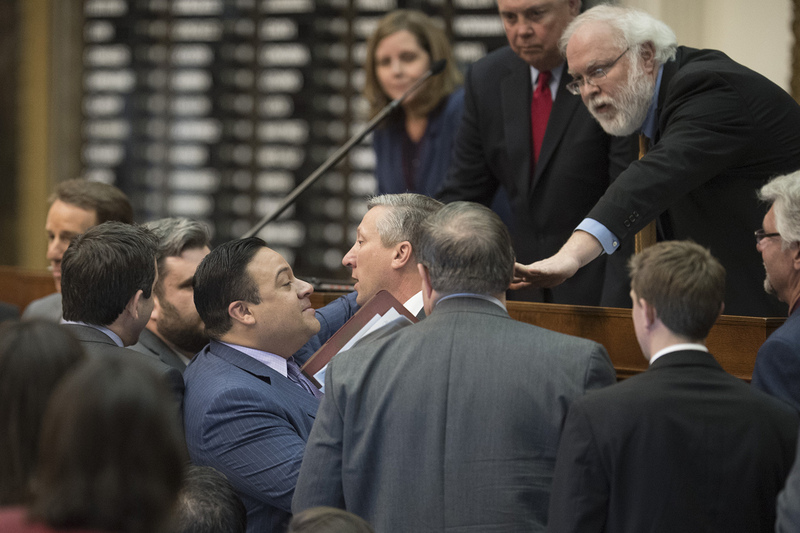 Bob Daemmrich for The Texas Tribune Perhaps the most heated moments of the debate arose between Stickland and Rep. Drew Springer, R-Muenster, over continued funding of a feral hog abatement program. Here, House Parliamentarian Chris Griesel signals time out as tempers flare. Bob Daemmrich for The Texas Tribune Stickland had filed an amendment to defund the state program, a favorite in rural counties. 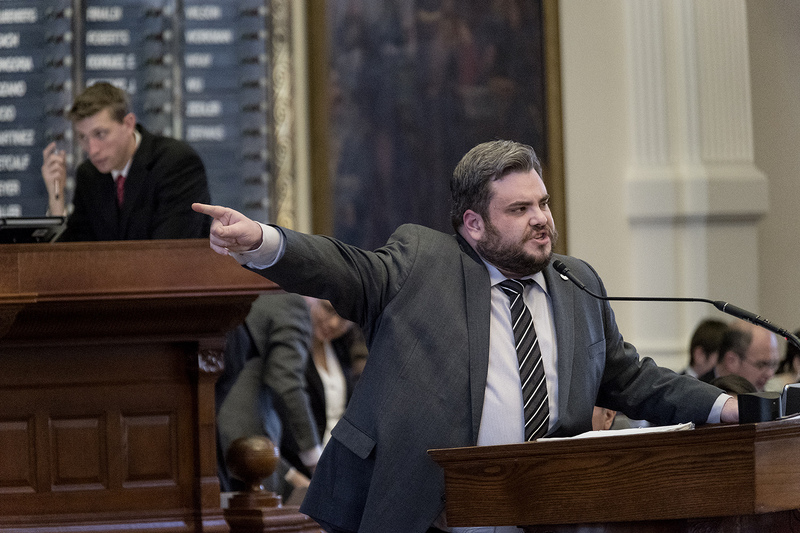 Springer countered by attaching an amendment to Stickland's amendment cutting the same amount of funding for the Texas Department of Transportation — but only for Bedford, Stickland’s hometown. Bob Daemmrich for The Texas Tribune Later, on the House floor, fellow House members had to physically intervene. Springer's amendment passed, forcing Stickland to withdraw his. Bob Daemmrich for The Texas Tribune As the night wore on, amendments to the budget passed or failed as the House crafted its final version. Here, Rep. Helen Giddings, D-DeSoto, chats with fellow legislators. Bob Daemmrich for The Texas Tribune Finally, at about 1:30 a.m. Friday, the House passed out its budget, 131-16. Next comes reconciliation with the Senate's budget. They've got a lot to work out. "I’m optimistic that we will find common ground with the Senate on these and many other issues,” Straus said in a statement. Bob Daemmrich for The Texas Tribune Correction: An earlier version of this story incorrectly referred to state Rep. Charlie Geren as a 20-year veteran of the Texas House. 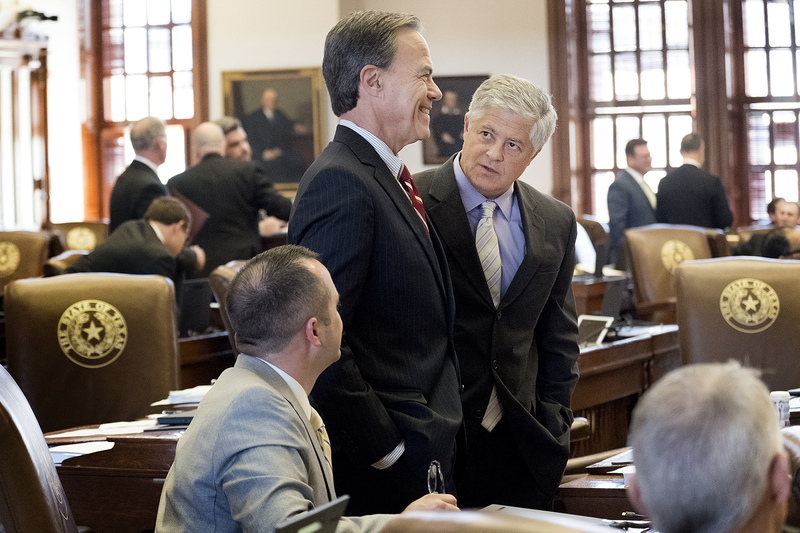 "The House takes up the budget: a day in pictures" was first published at by The Texas Tribune, a nonprofit, nonpartisan media organization that informs Texans — and engages with them — about public policy, politics, government and statewide issues. 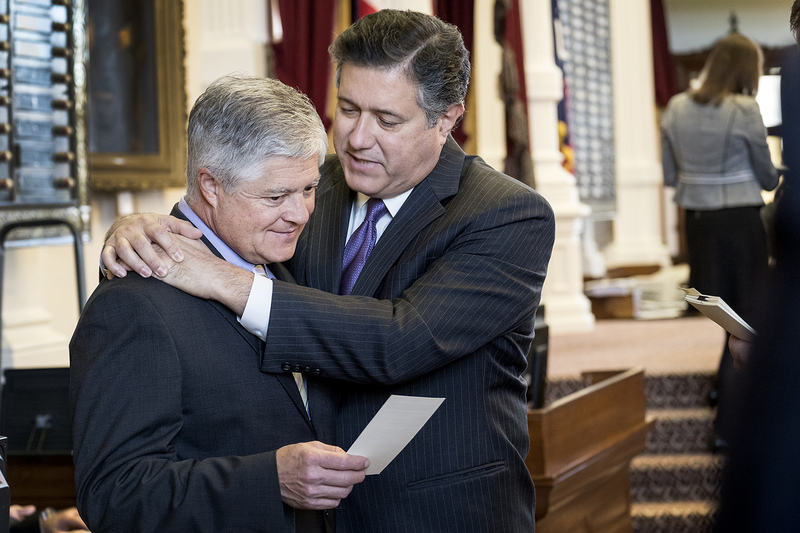 Link back to the original article, which is located at https://www.texastribune.org/2017/04/08/texas-house-takes-budget-day-pictures/.